It’s super easy to sleep all day and party all night in Ibiza. But there is a lot more to the island than just all night parties. So while you’re holidaying on the island this summer, why not take a day to go and explore the island by trying out one of these adventure sports. Now, this is something you just have to do in Ibiza. You think the island is beautiful from the ground, but wait until you see it from the sky. A speedy jet boat will take you from the shore of San Antonio, out to the ocean and then you’ll get fastened to a parachute which will hoist you up to 400 meters into the air. Yes, it sounds scary but believe us, once you’re above the ocean, it’s so peaceful and the experience is one of a kind. The wind will rush through your hair, you’ll have the best time with your friends or family and the pictures you’ll have captured will be a reminder of one of the best things you’ll have done in Ibiza. 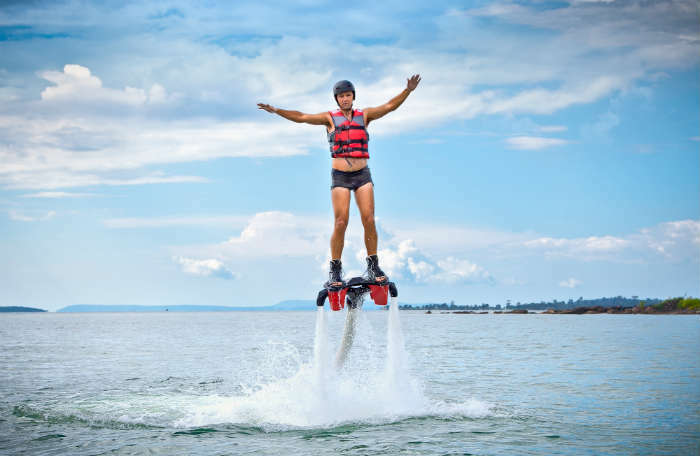 This adventure sport is relatively new on the island of Ibiza but if you fancy being powered up into the air by powerful water jets fastened to your feet, then give flyboarding a go. This exhilarating sport starts with a boat journey out to a beautiful part of Ibiza’s coast and then it’s your turn to get out into the water. If you’ve ever wanted to feel like a superhero, this might be a good chance to have your moment. Pedalos may not be as adventurous as the rest of the activities on this list but we’re still recommending them as a fun thing to do out on the water. Grab your friends, pedal out to quiet coves and get some music playing for a chilled out day in the sun. 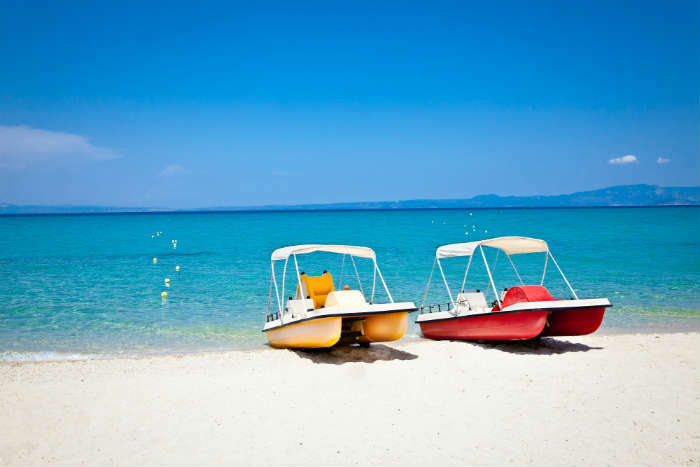 Also, if you’re with a young family, a pedalo is a great way to get out into Ibiza’s nature and have a relaxed few hours with the family. 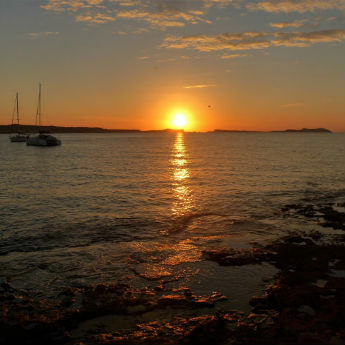 If you time it right, you might even get to enjoy Ibiza’s legendary sunset from the comfort of your pedalo. If you like your adrenalin rushes, you’ll definitely get what you’re looking for on one of Ibiza’s Jetboat trips. These super high speed boats rocket across the water and bounce across the waves while the driver pulls 180 and 360 turns, taking you on a rollercoaster ride across the ocean. Just as you think you’ve hit top speed, you’ll go a little bit faster and then get thrown into a power brake stop to make the adventure that little bit more thrilling! This is one ride on the ocean you won’t forget in a hurry! For an adventure watersport with a twist, why not give stand up paddleboarding a go? This is something we tried out on our recent #icelollyinIbiza trip and it was incredibly fun. Once you have your balance on the board, the world is your oyster. Well, at least the Ibizan coastline is. So take the time to explore the clear blue waters and discover quiet beaches. Also, for those of you who are missing doing a work out in Ibiza, stand up paddleboarding is a great way to give yourself a full body work out and to enjoy the sun and ocean at the same time. Now this isn’t one for the faint hearted, or those scared of heights. But, if you are a bit of a daredevil, and have a liking for jumping into the ocean from above, why not go cliff diving? 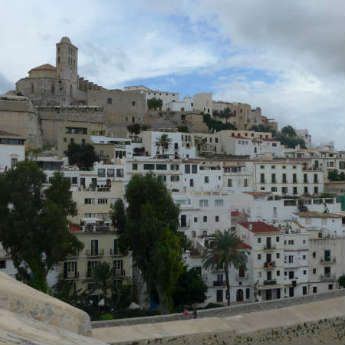 This might sound a bit dangerous but this activity comes with a guide who knows all the best spots so that you can dive off those spectacular Ibizan cliffs with complete ease of mind. If this sounds like something your friends would be into but it’s not quite the thing for you, you can still go along and watch all your friends get nervous before their big jump into the ocean. Do you want a family friendly, or just a plain fun activity? Try out Ocean Mania, across from the Ocean Beach Club, an inflatable waterpark with a variety of obstacles, waterslides, swing ropes and bridges all designed to give you an afternoon of fun in the sun. 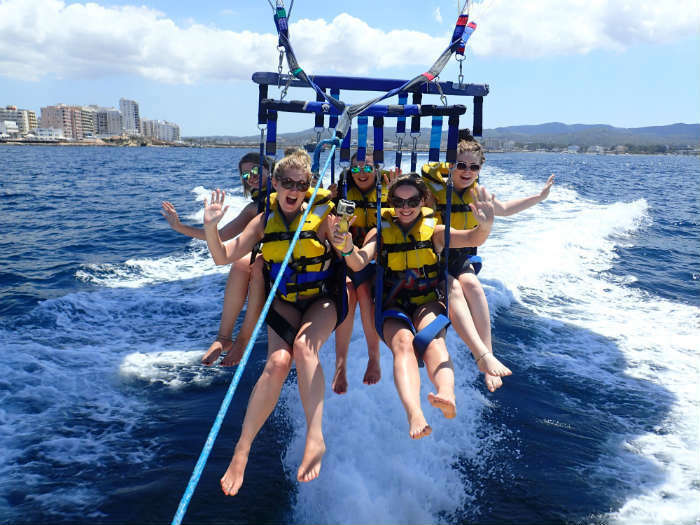 This is a pretty new activity to grace the waters of Ibiza, so even if you’ve tried several of the adventurous activities above before, this might be something just a little bit different to do on your holiday in the White Isle. 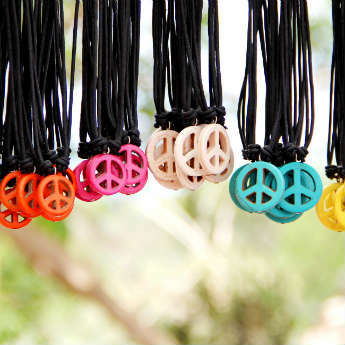 Which of these have you tried on your holiday in Ibiza? Is there any you want to give a go on your next time in the White Isle?